12/06/15 -- EU grains closed mixed. Wheat traded lower for much of the day, but turned around a little in mid-afternoon deals when US markets consolidated a little from the losses of the past few days. Jul 15 London wheat ended GBP0.90/tonne higher at GBP116.50/tonne, Sep 15 Paris was unchanged at EUR180.25/tonne, Aug 15 Paris corn was down EUR0.50/tonne at EUR163.25/tonne, whilst Aug 15 Paris rapeseed was up EUR2.25/tonne to close at EUR372.50/tonne. For the week that puts nearby London wheat five pence lower, with Paris wheat down EUR4.25/tonne, corn EUR1.75/tonne easier and rapeseed down EUR4.00/tonne. Brussels said late yesterday that they'd approved 477,677 MT worth of EU soft wheat export licences this past week. That takes the season to date total to 30.3 MMT, an 11.4% advance on this time last year. French shipments are slowing up. Grain exports for the past week via the leading French grain hub of Rouen were 49% down on the previous week at 87,747 MT, and a four week low. Soft wheat accounted for 47,747 MT of that total, with Algeria the largest buyer taking 31,500 MT. The UK was also a wheat buyer, taking 4,247 MT. The past week's exports also included 40,000 MT of feed barley destined for China. 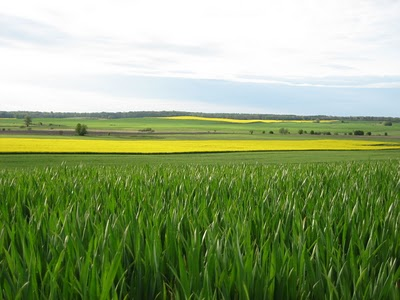 The Thompson Reuters crop tour of France, now in the Centre region of the country, said that rapeseed yields are pretty much now set, and likely to be 10-15% down on a year ago, but that there was still time for rain to improve wheat potential. Even so wheat yields will be down 10-15% even if it does rain in the next two weeks, and possibly as much as 25-30% without rain, they said. 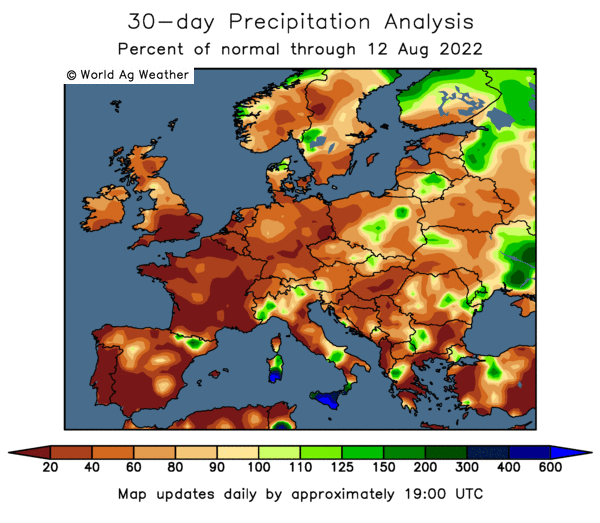 Whilst northern France is forecast to remain dry across the next 14 days, more central and southern parts should pick up some better than normal rains. That continued dryness in the north looks set to extend into much of the UK, the low countries and the northern half of Germany. Russia said that its spring grain plantings were 98.7% complete on 30.6 million ha versus the 31.1 million ha that had been planted this time last year. Wheat planting has now taken place on 13.3 million ha, which is over 100% of the Ministry target, they say. They've also sown 8.2 million ha of barley and 2.7 million ha of corn. APK Inform said that Russia could produce a record 11.8 MMT of corn this year, up 4% versus 2014. MDA CropCast yesterday went even higher at 12.7 MMT. They also forecast the Ukraine grain crop at 56.9 MMT this year, down 11% on a year ago. The vibe coming through is that production prospects in Ukraine, and quite possibly Russia too, aren't anything like as bad as they looked/were feared earlier in the year. The HGCA noted that the number of Russian offers at yesterday's Egyptian tender quite possibly indicates that exporters there may be even keener than normal to get some volume away onto the international market as soon as possible after harvest. That minimises the chances of the new export duty kicking in, if and when the rouble falls much further. Yesterday's price paid by Egypt of $190.50 FOB is the equivalent of around RUB10,500, the duty is only a token RUB50 provided that prices don't rise above RUB11,000. Based on today's exchange rate that's about $200/tonne, so things aren't that far away, in fact some of yesterday's Russian offers were actually at prices that were higher than that threshold. Egypt was back in the market again today, this time booking two cargoes of Romanian wheat and one of Russian origin. The price paid for the latter was just under $192/tonne (around RUB10,600/tonne). The Romanian wheat was slightly more expensive at $192.16/tonne, although the freight was a little bit cheaper. 11/06/15 -- Soycomplex: Beans closed lower, with Brazil's CONAB adding to the bearish tone created by yesterday's USDA report. They raised their estimate for the 2014/15 Brazilian soybean crop from 95.07 MMT to a new record 96.04 MMT, which is now more than 1.5 MMT above what the USDA gave us just yesterday and 11% above last year's production. The Rosario Grain Exchanged chipped in with a 2014/15 Argentine production estimate of 60.1 MMT, which is also above yesterday's 59.5 MMT offering from Washington. MDA CropCast were unchanged on their forecast for the world soybean crop in 2015/16 at 302.72 MMT, a small decline on this season of 0.7 percent. The see the US crop at 3.8234 billion bushels, and have next year's output in Brazil at 98.3 MMT (another new record) and forecast production in Argentina at 57.01 MMT (they have this season's crop above both the Rosario Exchange and the USDA at 60.45 MMT). Not to be outdone, the Buenos Aires Grain Exchange raised the bar on Argentina even higher, releasing a new 2014/15 soybean crop estimate of 60.8 MMT, adding that the harvest is now 96.6% complete. The Argentine government said that farmers there are 41.3% sold on this year's soybean crop versus 36.9% sold a year ago. A Bloomberg survey into trader/analyst sentiment found 6 bullish, 10 bearish and 5 neutral on bean prices. A bit of support came from the USDA reporting weekly export sales on old crop beans of 164,000 MT, along with new crop sales of 389,300 MT. Pre-report estimates had been for 100,000–200,000 MT on old crop beans and 350,000-400,000 MT on the new crop. Weekly old crop meal sales were also towards the high side of the range at 129,700 MT. There were also new crop meal sales of 49,900 MT. Jul 15 Soybeans closed at $9.40, down 9 1/2 cents; Nov 15 Soybeans closed at $9.08 3/4, down 13 cents; Jul 15 Soybean Meal closed at $313.40, down $1.00; Jul 15 Soybean Oil closed at 33.29, down 58 points. Corn: The corn market closed around a cent or so easier. CONAB increased their forecast for the 2014/15 Brazilian corn crop from 78.59 MMT to 80.21 MMT, now a marginal increase on last year. The Buenos Aires Grain Exchange were unchanged on their forecast for the 2014/15 Argentine corn crop at 25.0 MMT. Harvesting is 40.7% complete, they said. The Argentine government said that farmers there are 49.7% sold on this year's corn crop versus 40.8% sold a year ago. MDA CropCast estimated the world 2015/16 corn crop at 961.1 MMT, up 1.19 MMT from a week ago. Their forecast for this year's US corn crop was unchanged at 13.802 billion bushels, down 3.9% on a year ago. Russia's crop was hiked 1.22 MMT to 12.7 MMT. On the US weather front "the forecast is suddenly very wet, calling for above average rainfall in Midwest corn and soybean farms in the upcoming week. How much rain is too much? Midwest farms have received surplus rainfall over the past 2 weeks, turning fields soggy. Ponding has developed in the low-lying areas, submerging corn and soybeans. While ponding is not widespread, it may become so with above-average rains predicted in the week ahead," said Martell Crop Projections. "The current swath of moisture covering the bulk of the Midwest is expected to pour nearly 4” – 5” of rain over the next 5 days," added Benson Quinn. Weekly US export sales of 495,600 MT for delivery in 2014/15 were up 7 percent from the previous week, but down 14 percent from the prior 4-week average, said the USDA. New crop sales of 115,500 MT were also reported. Weekly corn shipments were just over 826,000 MT, the lowest volume seen since the end of March. Tonight's close keeps the new crop soybean:corn price ratio around the 2.43:1 mark that it has been fairly steady at for the last few weeks. A Bloomberg survey into trader/analyst sentiment found 7 bullish, 10 bearish and 4 neutral on corn prices. Jul 15 Corn closed at $3.56 1/2, down 3/4 cent; Dec 15 Corn closed at $3.74 1/4, down 1 cent. Wheat: The wheat market closed lower, in a general hangover from yesterday's USDA report. Weekly export sales weren't too thrilling to kick off the new 2015/16 marketing year at 376,700 MT. That, combined with the news that US wheat was comfortably priced out in today's Egyptian tender, whilst not exactly a surprise, simply further re-enforced the view that US wheat is too expensive to make inroads into all but traditional US homes. US SRW wheat was offered at $227.67/tonne versus the winning bid of $190.50/tonne for Russian wheat, and freight of course is also far cheaper from Russia too. CONAB cut their forecast for the 2015 Brazilian wheat crop from 7.05 MMT to 6.76 MMT. The Argentine government said that farmers there are 78.5% sold on this season's wheat crop versus 55.3% sold a year ago. The Buenos Aires Grain Exchange said that good weather had allowed Argentine growers to get 22.1% of their 2015/16 winter wheat crop sown. They estimated plantings at 4.1 million ha. The Rosario Exchange are even more pessimistic, saying that these could fall to only 3.5 million ha. That would match the USDA's estimate for plantings in 2013/14, and that was the lowest since at least 1960. The USDA cut their forecast for Argentine wheat plantings from 4 million ha to 3.8 million yesterday. Pakistan said that their 2015/16 wheat crop had come in at 25 MMT, up 0.5 MMT on last year. Taiwan tendered for 97,000 MT of US wheat for Aug/Sep shipment. MDA CropCast estimated the world wheat crop up 1.27 MMT from a week ago at 711.8 MMT. They raised their outlook on US winter wheat by 23 million bushels to 1.553 billion bu. Russia's crop was raised 1.6 MMT to 55 MMT and Ukraine's was increased 0.84 MMT to 22.8 MMT. The USDA's FAS in Ukraine said that this year's wheat production prospects had improved substantially. MDA CropCast cut their outlook on this year's Australian wheat crop by 1.36 MMT to 23.1 MMT. A Bloomberg survey into trader/analyst sentiment found 6 bullish, 9 bearish and 5 neutral on wheat prices. Jul 15 CBOT Wheat closed at $5.04 1/4, down 9 1/4 cents; Jul 15 KCBT Wheat closed at $5.23 1/4, down 7 1/4 cents; Jul 15 MGEX Wheat closed at $5.62 3/4, down 4 1/4 cents. 11/06/15 -- EU grains closed mostly lower in the continued fallout from last night's bearishly construed USDA report. At the close Jul 15 London wheat was down GBP2.60/tonne at GBP115.60/tonne, Sep 15 Paris was EUR3.25/tonne weaker at EUR180.25/tonne, Aug 15 Paris corn was down EUR1.00/tonne at EUR163.25/tonne, whilst Aug 15 Paris rapeseed fell EUR0.75/tonne lower to close at EUR370.25/tonne. New crop Nov 15 London wheat had rallied 10.6% from the mid-May low when it peaked at GBP130/tonne yesterday morning. "The early June rally in UK feed wheat futures brought the Nov 15 contract almost within GBP2/tonne of the post-planting average," said the HGCA today. "However, futures prices fell once again yesterday, mirroring events in March when prices last approached the average but failed to break through," they noted. Going through the minutiae of last night's USDA report, we see that they increased their forecast for this year's EU wheat yields from 5.66 MT/ha to 5.69 MT/ha. Although they trimmed back their planting estimate from 24.56 million ha to 24.50 million, that still takes production up by around 400 TMT to 150.7 MMT. Conditions in May were favourably wet in France and the UK, slightly unfavourably dry in central Europe, and unfavourably hot and dry in Spain. NDVI and weather analysis, as well as positive local reports, have led to a production increase of 1 MMT in France and 0.5 MMT in the UK, they said. Russia's wheat crop was raised by 1.5 MMT to 55 MMT. Yields were forecast at 2.18 MT/ha, up 2% from last month, although still down 13% from a year ago. "Winter wheat in the key Southern District benefited from precipitation in May and early June, especially in the northern half of the district where winter crops were in poor condition earlier in the spring," they said. "Crop vigour remains generally poor in the Central District, where satellite-derived vegetation indices indicate that Winter wheat has not satisfactorily recovered from the severe fall dryness that hampered crop emergence and establishment," they added. Ukraine's 2015 wheat production potential was increased 1 MMT to 23 MMT. The harvested area was estimated at 6.8 million ha against 6.3 million last year. Yield was forecast at 3.38 MT/ha, up 3% from last month, but still down 14% from last year. "Severe dryness hampered winter-wheat emergence and establishment last fall, and crop conditions were extremely poor when Winter wheat resumed vegetative growth in March. Winter wheat yield prospects improved significantly following beneficial rain in April and May although some territories still show evidence of dryness," they said. 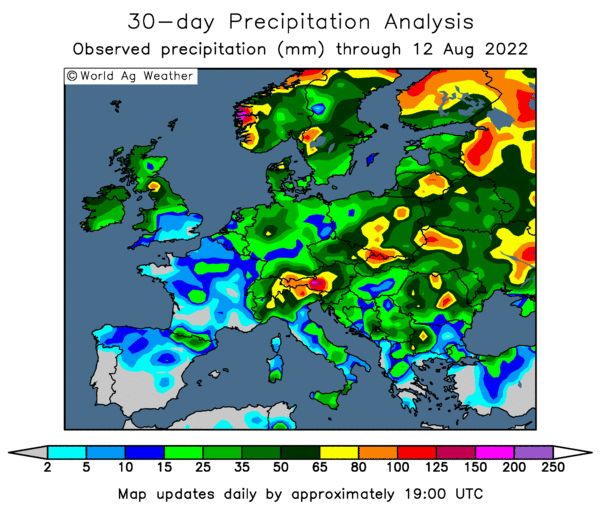 They pared back their forecast for EU corn plantings, and estimated EU barley yields a tad lower than a month ago. Both of which led to small reductions in projected production for each this year compared to a month ago. EU rapeseed production this year was raised 0.5 MMT to 22.1 MMT. That came courtesy of yields being estimated at 3.37 MT/ha, up 2.1% from last month, although still down 6.1% from last year’s record. 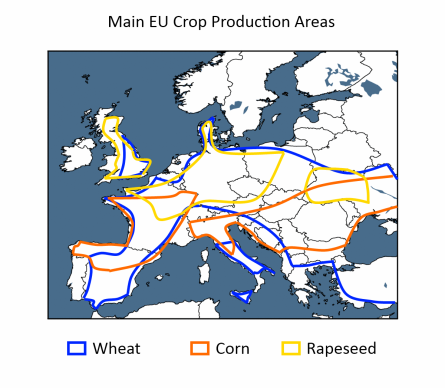 "The estimate for EU rapeseed was raised because of favourable spring weather in the major growing areas of northern Europe and minimal insect damage," they noted. A Thompson Reuters crop tour of France moved on from the northern Picardie region to the centre of the country and Burgundy. Here they found that "conditions have deteriorated since mid-spring and the crops need rain" - without which losses could reach 15%, they said. In Dijon, rain hasn't fallen in over a month, reducing yield potential, they say. 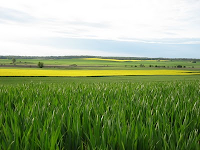 EU restrictions on fertiliser and pesticide usage are also having a negative impact on protein levels in wheat, and some fairly widespread flea beetle damage is evident in rapeseed crops in the area, they added. In other news, in the first 10 months of 2014/15 the UK imported 1.734 MMT of corn, said the HGCA. That's a 24% decrease on a year ago. France at just over 600 TMT was the leading supplier, although around 200 TMT each came from Romania and Ukraine, followed by over 150 TMT from Argentina. Egypt's GASC tested the water today with a tender for wheat for Jul 11-20 shipment. Despite talk that Russian exporters are reluctant to commit to forward sales because the new Jul 1 export tax on wheat is linked to the value of the rouble, which after its recent decline in value increases the chances of being levied at more than the minimum RUB50/tonne (around one US dollar), Russian origin accounted for 7 of the 12 offers made. It was also priced the lowest in the winning bid from Louis Dreyfus ($190.50 FOB) which again came in below $200/tonne including freight. The next cheapest offer after that was Romanian wheat at $193.67/tonne FOB, with the rest of the Russian offers in the $195-203/tonne region. The only French offer was $213.67/tonne, and US material was priced even further out at $227.67/tonne. 10/06/15 -- Soycomplex: Beans closed reluctantly a little lower, dragged down by falling wheat and corn, following the release of the June WASDE report from the USDA. In that they raised Argentina's 2014/15 soybean crop by 1 MMT from a month ago to 59.5 MMT, a bit more than the average trade estimate of 59.18 MMT. They left Brazil unchanged at 94.5 MMT though compared to the average trade estimate of a rise to 94.76 MMT. They showed US old crop soybean ending stocks tightening to 330 million bushels, down from 350 million in the previous report and a bit below the 339 million average trade guess. New crop ending stocks were pegged at 475 million bushels, down 25 million from last month and again a little bit under the average market idea of 487 million. They went unchanged on US soybean production this year at 104.78 MMT, still a modest 3% decline on last year's record crop. Brazil and Argentina were unchanged for 2015/16 at 97 MMT and 57 MMT respectively. Both their exports were also unchanged, along with Chinese imports of a record 77.5 MMT in the season ahead. Global 2015/16 ending stocks were reduced 3 MMT to 93.2 MMT, although that's still almost 10 MMT more than in the current season. In other news, Safras e Mercado estimated Brazil’s 2015/16 soybean crop at a new record 98.6 MMT. Dr Cordonnier estimated the Brazilian 2014/15 bean crop at 94.5 MMT, and Argentina's at 60 MMT, both unchanged from his previous estimates. Conab are due out tomorrow with their Brazilian crop estimates. Chinese industry analysts estimated the country's June soybean imports at a large 8.596 MMT. Trade ideas for tomorrow's weekly export sales report are 100,000–200,000 MT for old crop beans and 350,000-400,000 MT on the new crop. Jul 15 Soybeans closed at $9.49 1/2, down 2 cents; Nov 15 Soybeans closed at $9.21 3/4, down 3 1/4 cents; Jul 15 Soybean Meal closed at $314.40, down $2.10; Jul 15 Soybean Oil closed at 33.87, down 6 points. 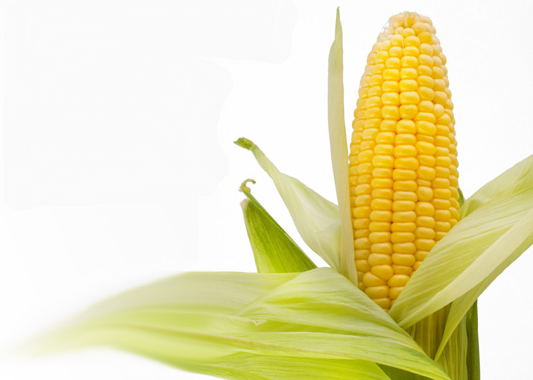 Corn: The corn market closed around 7-8 cents lower. "The WASDE didn’t offer much support to corn with the surprise being the increase in global ending stocks. The USDA added 4.51 MMT to the 2014/15 global ending stocks number citing better production in South America. They added 3 MMT to the Brazilian crop and 0.5 MMT to the Argentinian crop," said Benson Quinn. That took world ending stocks for the current season up to 197 MMT versus an average trade guess that was little changed from a month ago at 192.52 MMT. It was also above the highest estimate in the range of trade guesses. Brazil's 2014/15 corn crop is now seen at 81 MMT versus an average trade estimate of 78.70 MMT. As far as the 2015/16 season goes, the only major change was adding 1 MMT to Russia's production potential, taking that up to 13 MMT. US output this year was forecast unchanged from last month at 346.22 MMT, a 4% decline on last year's record. The USDA put its US old crop corn ending stocks at 1.876 billion bushels, up 25 million from the May report, and a bit higher than the average trade guess of 1.859 billion. World 2015/16 ending stocks were pegged at 195.19 MMT compared to an average trade guess of 191.90 MMT. In other news, Dr Cordonnier estimated 2015 US corn yields at 167.0 bu/acre, unchanged from his previous estimate. He forecast the Brazilian 2014/15 corn crop at 79 MMT and estimated Argentina's at 24.5 MMT, both also unchanged from previously. Ukraine said that they'd exported 32.72 MMT of grains so far this season, including 17.44 MMT of corn. The Ukraine Ag Ministry estimated full season grain exports at 36.8 MMT versus 32.4 MMT in 2013/14. Chinese analysts said that their corn stocks could exceed 100 MMT at the end of this season (record levels) The Chinese government are to attempt to auction off 5 MMT of corn reserves over the next couple of days. The Taiwan Sugar Corp bought 23,000 MT of US corn for October shipment . Russia said that their 2015 corn crop was now 95.9% planted on 2.7 million ha, up 0.2 million on this time last year. The US Energy Dept put US ethanol production in the past week at a record 992,000 barrels/day. Jul 15 Corn closed at $3.57 1/4, down 7 3/4 cents; Dec 15 Corn closed at $3.75 1/4, down 7 3/4 cents. Wheat: The wheat market closed around 12-18 cents lower. "The picture in wheat looks pretty bleak and today’s report didn’t offer any new inspiration for the length. Supplies are expected to remain ample and the USDA increased potential domestic and global production despite various hints that production in India and/or Australia could be lowered. There may be a point to address the dryness issues in Canada as well," said Benson Quinn. World 2015/16 wheat production was raised 2.62 MMT to 721.55 MMT. Russia's crop this year was increased by 1.5 MMT to 55 MMT, and Ukraine was upped 1 MMT to 23 MMT. US all wheat production was pegged at 2.121 billion bushels versus and average trade guess of 2.110 billion. World ending stocks for 2015/16 were lowered almost 1 MMT from a month ago to a still more than ample 202.4 MMT - and the highest since 2001/02. US new crop ending stocks were increased to 22.16 MMT, up more than 14% compared to the previous season and the most since 2010/11. In other news, ABARES estimated the 2015/16 Australian wheat crop at 23.6 MMT, down from 24.4 MMT previously, and fractionally below last year's 23.67 MMT. The USDA were at 26 MMT today. ABARES estimated the Australian barley crop at 8.25 MMT versus 8.01 MMT a year ago. Russia bought more than 45 TMT of grain at intervention today, taking the total bought so far to 1.08 MMT. The head of the Russian Grain Union estimated wheat exports there to be around 5 MMT below their potential in 2015/16 due to the new government export tax, placing these at 17-18 MMT. The USDA today increased their estimate by 1 MMT to 21 MMT. Taiwan are tendering for 97,420 MT of US wheat for Aug-Sep shipment. Japan are expected to buy 118 TMT of US, Canadian and Australian wheat tomorrow. Israel was said to have bought optional origin feed wheat and optional origin corn for Jul–Sep shipment. Kazakhstan said that their spring grain planting was 98.6% complete on 14.41 million ha. They estimate the final planted area at 15.2 million ha, of which 12.2 million will be wheat. "Besides the negative fundamental picture, the issue in wheat is the likelihood that the funds have pared their net short positions to manageable levels," suggested Benson Quinn. Jul 15 CBOT Wheat closed at $5.13 1/2, down 18 3/4 cents; Jul 15 KCBT Wheat closed at $5.30 1/2, down 17 3/4 cents; Jul 15 MGEX Wheat closed at $5.67, down 15 3/4 cents. 10/06/15 -- EU grains closed lower across the board, as their counterparts in Chicago would do later, following the release of the June WASDE report from the USDA. At the finish Jul 15 London wheat ended GBP1.15/tonne lower at GBP118.20/tonne, Sep 15 Paris was EUR2.50/tonne weaker at EUR183.50/tonne, Aug 15 Paris corn was down EUR2.75/tonne at EUR164.75/tonne, whilst Aug 15 Paris rapeseed stumbled EUR1.75/tonne lower to close at EUR371.00/tonne. Wheat had traded in the green in early trade, with both old and new crop London wheat matching yesterday's 2-month highs, but quickly turned negative. There are lingering concerns over dryness in France. A Thompson Reuters crop tour in the Picardie region, one of the most productive areas, in northern France found a yield potential of around 8.5 MT/ha, but said that if rain doesn't arrive soon then that could drop below 8.0 MT/ha. June rains are very important in determining final yields, they noted. 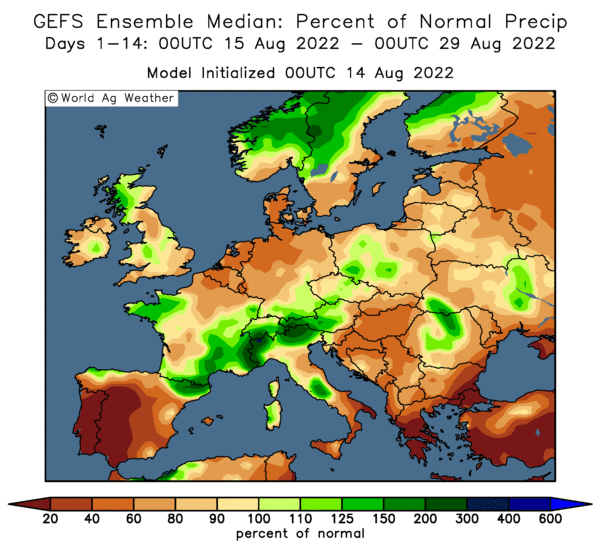 If they do arrive, and they are in the forecast, then France could still be in for a record wheat crop this year, with plantings at a near 80 year high. The previous record soft wheat crop was the 38.2 MMT produced in 1998. The French Ministry this week said that soft wheat plantings were at 5.17 million ha, and ODA recently pegged national yields at an average 7.70 MT/ha, potentially giving them a record 39.80 MMT crop this year. Russia said that spring grain plantings there were 97.6% complete on 30.3 million ha. The spring wheat crop is now all in on 13.2 million ha, combined with 98.5% of the spring barley and 95.9% of the corn crop, said the Ag Ministry. The president of the Russian Grain Union estimated grain production there at 95-96 MMT this year, down from 105.3 MMT a year ago. He estimated total grain exports in 2015/16 at 30 MMT, similar to this season, but 5 MMT below the country's potential due to the export tax on wheat. He estimated wheat exports at 17-18 MMT versus 22 MMT this season, and pegged the wheat harvest at 54-55 MMT versus 59 MMT a year ago. Later in the day, the USDA raised their forecast for this year's Russian wheat crop from 53.5 MMT to 55.0 MMT. Ukraine's crop was upped 1 MMT to 23 MMT and Europe's was increased from 150.3 MMT to 150.7 MMT. The bottom line was that they added 2.62 MMT to global production in 2015/16, taking that up to 721.55 MMT, only a very small decline of less than 1 percent on last year's record output. On the export front, they raised both Russia and Ukraine by 1 MMT from a month ago to 21 MMT and 11.5 MMT respectively. EU exports were left unchanged at 32.5 MMT. Europe's 2015 corn crop was reduced marginally, down from 68.34 MMT to 68.14 MMT, and barley output here was also trimmed a fraction - down from 58.68 MMT to 58.54 MMT. The EU rapeseed crop was estimated at 22.1 MMT, a near 9% decline compared with last season. It is also nearly 3 MMT below projected consumption in 2015/16. In other news, Ukraine said that they'd now exported 32.72 MMT of grains this season, including 10.54 MMT of wheat, 4.46 MMT of barley and 17.47 MMT of corn. 09/06/15 -- Soycomplex: Beans closed higher, with the November contract trading at its highest level since May 19. Meal posted strong gains too, with oil again the weakest leg of the complex, reversing the recent trend. Today was probably all about positioning and a bit of book-squaring/profit-taking prior to tomorrow's USDA WASDE report. That is expected to peg US 2014/15 soybean ending stocks at 339 million bushels, the range of estimates being 302-360 million and the USDA's May estimate was 350 million. The coming 2015/16 season ending stocks are estimated at 487 million bushels, the range of estimates is 433-569 million and the USDA's May estimate was 500 million. World 2014/15 ending stocks are forecast at 85.80 MMT, the range of estimates being 84.20–86.71 MMT and the USDA's May estimate was 85.54 MMT. World 2015/16 ending stocks are seen at 96.00 MMT, the range of estimates is 90.25-97.33 MMT and the USDA's May estimate was 96.22 MMT. For Argentina this year the average trade estimate is 59.18 MMT versus the USDA's May estimate of 58.50 MMT. Brazil is seen at an average of 94.76 MMT versus the USDA's May estimate of 94.5 MMT. CONAB come out on Thursday with their latest 2014/15 Brazilian crop estimate updates. They had the Brazilian bean crop at 95.07 MMT in May. Informa are due out on Thursday or Friday with their 2015 US acreage estimate updates. They saw US soybean plantings this year at 87.185 million acres last tine. Last night's USDA crop progress report suggests that the best part of 18 million acres of soybeans are still unplanted in the US using their March 31 planting intentions estimate of 84.635 million acres. Jul 15 Soybeans closed at $9.51 1/2, up 7 1/4 cents; Nov 15 Soybeans closed at $9.25, up 4 3/4 cents; Jul 15 Soybean Meal closed at $316.50, up $7.00; Jul 15 Soybean Oil closed at 33.93, down 17 points. Corn: The corn market closed a fraction lower. The trade must consider itself positioned where it wants to be heading into tomorrow's USDA report. That is expected to show 2014/15 US corn ending stocks at 1.859 billion bushels, from within a range of estimates of 1.775-1.964 billion and little changed from the USDA's May estimate of 1.851 billion. US ending stocks in 2015/16 are seen at an average of 1.779 billion bushels, the range of estimates is 1.662-2.053 billion and the USDA were at 1.746 billion last month. World 2014/15 ending stocks are forecast at an average of 192.52 MMT, the range of estimates is 188.00-194.00 MMT and the USDA's May estimate was 192.50 MMT. World 2015/16 corn ending stocks are seen at an average of 191.90 MMT, the range of estimates is 187.00-199.70 MMT, and the USDA's May estimate was 191.94 MMT. The Argentine corn crop is forecast at an average of 25.10 MMT, from within a range of estimates of 23.70-29.80 MMT and up from the USDA's May estimate of 24.50 MMT. The Brazilian corn crop is seen at 78.70 MMT, the range of estimates is 76.50-81.10 MMT and the USDA's May estimate was 78.00 MMT. For CONAB on Thursday the Brazilian corn crop was estimated by them at 78.59 MMT in May. The US corn area was estimated at 88.737 million acres by Informa in May versus a USDA March estimate of 89.1 million. That figure will be updated later in the week, and the USDA's number will be fine tuned at the end of the month. In other news, the French Ag Ministry forecast corn plantings there this year to fall 7.8% to 1.71 million ha. Russia said that it's corn crop is 95.6% planted on 2.7 million ha. APK Inform said that Ukraine seaports shipped out 2.2 MMT of grains in May of which 1.8 MMT was corn. Mexico are said to be seeking US corn for Aug-Sept shipment. China said it’s corn stocks have reached a record high. Jul 15 Corn closed at $3.65, down 1/4 cent; Dec 15 Corn closed at $3.83, down 1/2 cent. Wheat: The wheat market closed higher on all three exchanges. The trade remains concerned about damage to the US crop by unseasonably heavy rains just prior to harvesting. Trade estimates for the US all wheat crop tomorrow average 2.110 billion bushels, the range of estimates is 2.050-2.191 billion, the USDA's May estimate was 2.087 billion and US 2014/15 all wheat production was 2.026 billion. US 2014/15 wheat ending stocks are seen at an average of 712 million bushels, the range of estimates is 685-734 million and the USDA May estimate was 709 million. New crop US ending stocks are forecast at 798 million bushels, the range of estimates is 672-876 million and the USDA's May estimate was 793 million. Old crop world wheat ending stocks are seen at 200.29 MMT, the range of estimates being 196.90- 201.15 MMT and the USDA May estimate was 200.97 MMT. New crop carryout is forecast at 201.72 MMT, from within a range of estimates of 194.00-205.72 MMT and versus the USDA May estimate of 203.32 MMT. For CONAB on Thursday the Brazilian 2015 wheat crop was estimated at 7.05 MMT in May. Informa had the 2015 US all wheat area estimated at 55.947 million acres in May versus a USDA March estimate of 55.4 million. In other news the Philippines seek 59,550 MMT of feed wheat for Sep-Oct shipment. 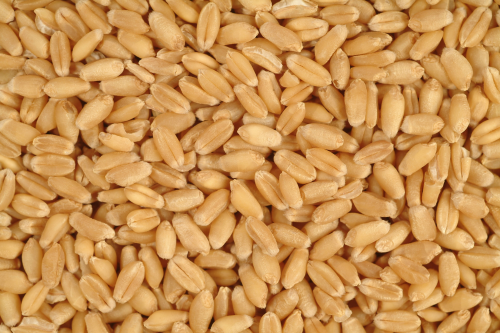 Japan is tendering for its regular weekly combo of US, Canadian and Australian wheat with the results due Thursday. China’s State Administration of Grain said that the country's 2015 wheat crop will be slightly above that of last year (as usual). The French Ag Ministry said winter wheat plantings there were up 3.2% at 5.17 million ha. Russia said that it's spring wheat crop was 99.4% planted on 13.1 million ha. The Russian Grain Union estimated Russia’s 2015 grain crop at 95-96 MMT. IKAR are more optimistic at 98-105 MMT, up 1.0 MMT from their previous estimate. SovEcon raised their forecast by 5 MMT earlier in the week to 99 MMT. India are said to be continuing to buy Australian wheat to blend in with their own inferior quality new crop this year. Jul 15 CBOT Wheat closed at $5.32 1/4, up 4 1/4 cents; Jul 15 KCBT Wheat closed at $5.48 1/4, up 3 3/4 cents; Jul 15 MGEX Wheat closed at $5.82 3/4, up 2 1/4 cents. 09/06/15 -- EU grains closed mixed, with both old and new crop London wheat pressing on to post their highest closes in what is just one day short of being two months. Jul 15 London wheat ended GBP1.40/tonne higher at GBP119.35/tonne, Sep 15 Paris was EUR0.25/tonne weaker at EUR186.00/tonne, Aug 15 Paris corn was also down EUR0.25/tonne at EUR167.50/tonne, whilst Aug 15 Paris rapeseed stumbled EUR1.75/tonne lower to close at EUR372.75/tonne. News of any great note was relatively lacking, but that shouldn't be the case tomorrow when we get the latest world supply and demand numbers from the USDA, along with ABARES take on crop prospects in Australia where winter plantings are currently underway. It could be a game of two halves in the latter location, with often favourable rains in Western Australia helping to compensate for potential yield reducing dryness in eastern states during an El Nino year. The French Ministry released their latest production and acreage numbers, forecasting a French winter barley crop of 8.87 MMT, some 3.7% higher than a year ago. In contrast they predict winter rapeseed production to decline 7.5% to 5.1 MMT. French winter rapeseed plantings were seen down 1.8% and yields are forecast to fall 6.5% to an average of 3.44 MT/ha this year. The spring rapeseed area in France is negligible. They didn't release any production estimates for wheat or corn, although they said that the winter wheat area was 5.17 million hectares, which is consistent with their previous forecast and a 3.2% increase on last year. It is also the highest since 1936. Corn plantings are seen 7.8% lower year-on-year at 1.71 million ha. French growing conditions are "good" although winter and spring crops need rain to continue their promising development, they said. Most of the country has above average rains in the 14 day forecast. Current warmer than normal temperatures are expected to remain through to Friday, followed by a return to more normal conditions after that. Russian analysts SovEcon said yesterday that the country's exporters have reduced forward wheat sales by around 25-30% due to concerns over the new variable export duty that kicks in on Jul 1. Given the recent volatility in the value of the rouble, to which the duty will be linked, exporters have been lobbying the government to change the formula being used to one that is dollar-linked, which is of course the unit of currency used when making foreign sales. The government have thus far refused. The Russian currency is down against the dollar by 11.2% in the past 3 weeks. The next duty kicks in if and when prices rise above RUB11,000/tonne. That was around $216/tonne when the new tax was announced, but today it's more like $197/tonne. Egypt's GASC recently paid around $191/tonne FOB for Russian wheat, with a delivery date of Jul 1-10, so those sales are now much closer to attracting the new export tax than they were. If the rouble was to fall another 11.2% versus the US dollar in the next 3 weeks then the price at which the duty kicks in would only be the equivalent $175/tonne in dollar terms! That certainly explains exporter reluctance to commit. Exporters do apparently have the ability to lodge sales with officials when they are made, according to Agrimoney, but there are various reasons why they would be reluctant to be quite so transparent with anybody, let alone the Russian government. APK Inform said that Ukraine seaports shipped out 2.2 MMT of grains in May, an impressive 66% increase compared with 12 months previously. Most of that (82%) was corn, which was 125% more than the volume exported via seaports in May 2014. The Romanian Farmers Association said that wheat production there could fall 30% this year, and rapeseed output could be down 15-20% on dryness, especially in the north and east of the country. Reuters report that the Indian port of Kochi is currently discharging its first consignment of wheat in a decade. The MV Pan Edelweiss is currently offloading 32,000 MT of Australian hard wheat. Traders there say that at least 10 vessels of a similar size have traded into India, with millers there estimated to have bought around 400 TMT of Australian wheat so far. The Indian crop was badly damaged by late season rains and hail immediately prior to harvesting, which as well as knocking as much as 15 MMT off earlier production estimates, will also have had a negative impact on quality this year. Hence the need to import more higher grade wheat in to blend with their own inferior domestic supplies. Scotiabank forecast the pound to rise to 1.50 versus the euro in 2016. Most leading analysts continue to lean towards a downwards trajectory for the single currency, with Lloyds predicting 1.45 by the end of the year and 1.47 in Q1 of next year. That should be supportive in the long term for Paris grain prices. 08/06/15 -- Soycomplex: Beans closed higher, aided by weekly export inspections of 216,590 MT, which were pretty decent given the time of year and the frenetic pace of early season shipments. Season to date shipments are now up almost 12% on year ago levels. The USDA currently predict US exports in 2014/15 to be 9.4% ahead of those in 2013/14, so they are ahead of schedule to meet that target. Chinese customs data shows that they imported 6.13 MMT of soybeans in May, up 2.7% versus a year ago and 15.4% higher than in April. June imports could be as high as 8.5 MMT some analysts are suggesting. Jan/May Chinese imports are still down 2.7% year-on-year at a little over 27 MMT however. Dr Cordonnier reports that a survey of growers in Brazil's Mato Grosso found that they only had 22% of their 2015/16 inputs (seeds, fertilisers, and chemicals) purchased at the end of April versus around 70% normally. Low grain/oilseed prices, high interest rates and a lack of credit are the problem, he says. Inflation and increased production costs are other factors inhibiting farmer's purchasing of inputs, he adds. After the close the USDA reported that soybean planting was 79% complete, up a relatively modest 8 points on the week, and now 2 points behind the 5-year average. Missouri is only 30% done versus 69% normally, and Kansas 31% sown compared to 76% on average. These are the two most notable laggards. Emergence is at 64% versus 63% on average. Crop conditions were placed at 69% good to excellent compared to 74% a year ago. Missouri and Kansas feature among the states with the worst conditions, along with Louisiana. The trade will now be looking to Wednesday's June WASDE report from the USDA to provide some direction. Average estimates for Argentine and Brazilian soybean production in that are 59.1 MMT and 94.8 MMT, respectively, say Benson Quinn. US 2014/15 ending stocks estimated at 340 million bushels versus 350 million in May, and 2015/16 US ending stocks are estimated at 487 million bushels versus 500 million in May, they add. Jul 15 Soybeans closed at $9.44 1/4, up 6 1/2 cents; Nov 15 Soybeans closed at $9.20 1/4, up 6 cents; Jul 15 Soybean Meal closed at $309.50, up $4.60; Jul 15 Soybean Oil closed at 34.10, down 68 points. Corn: The corn market closed around 4-5 cents higher, aided by spillover support from wheat. Weekly export inspections were at the low end of trade estimates at 740,543 MT versus 984,275 MT the previous week. They were also below the 1,054,545 MT average needed to meet the current USDA estimate for the season, noted Benson Quinn. APK Inform said that Ukraine seaports shipped out 525 TMT of grains last week, of which 98% was corn. The Ukraine Ag Ministry said that corn planting there was just about done on 4.28 million ha, down from 4.8 million a year ago. Clashes between separatists and the Ukraine military have flared up again in recent days. Russia said that their 2014/15 corn exports stand at 2.8 MMT, a significant drop on 3.9 MMT this time last year. The USDA didn't report on corn planting in the US tonight, suggesting that pretty much what is going to get sown is already now in the ground. Emergence was placed at 91% versus 90% on average and this time last year. Good to excellent crop conditions were essentially unchanged at 74% good to excellent, although there was a one point increase in excellent and a one point decrease in good. As with last week, the states displaying the worst crop conditions are Kansas and Missouri at 13% and 12% poor to very poor respectively due to excessively wet field conditions. On the US weather front, the developing El Nino event seems to be pretty firmly entrenched looking at the weather forecast. "Strong Midwest showers are predicted this week, fuelled by a moist air stream known as the Southwest monsoon. A surge of tropical moisture from Mexico is directed northward by the jet stream, spreading across Arizona and New Mexico, bending northeastward into Kansas and Nebraska, then pushing due eastward across the Midwest corn belt. The Midwest forecast is very wet indeed. The heaviest rainfall would target Nebraska, western Iowa, southern Minnesota and central Wisconsin, where 4-5 inches of rain is expected. Note the average weekly rainfall is 0.80 inch for the second week in June. Less heavy but above normal rainfall is expected in the balance of the Midwest, 1.5-1.75 inches. Flooding in the Midwest would be especially threatening for small, recently planted corn and soybeans," said Martell Crop Projections. Jul 15 Corn closed at $3.65 1/4, up 4 3/4 cents; Dec 15 Corn closed at $3.83 1/2, up 5 1/2 cents. Wheat: The wheat market closed with decent gains across the three exchanges. Weekly export inspections were no better than "routine" at 302,725 MT. The USDA had 161,004 MT of those as old crop. The USDA reported US winter wheat crop conditions fell one point in the good to excellent category this week to 43%. They said that harvesting of that was only 4% complete, half of what it was a year ago and only a third of the 5-year average. "Crop watchers are still assessing wheat conditions in the southern Great Plains, where widespread flooding developed in May. Some areas of Texas and southern Oklahoma received more than 17 inches of rainfall. Severely damaged wheat may not be suitable for harvesting, rather grazed out to cattle. 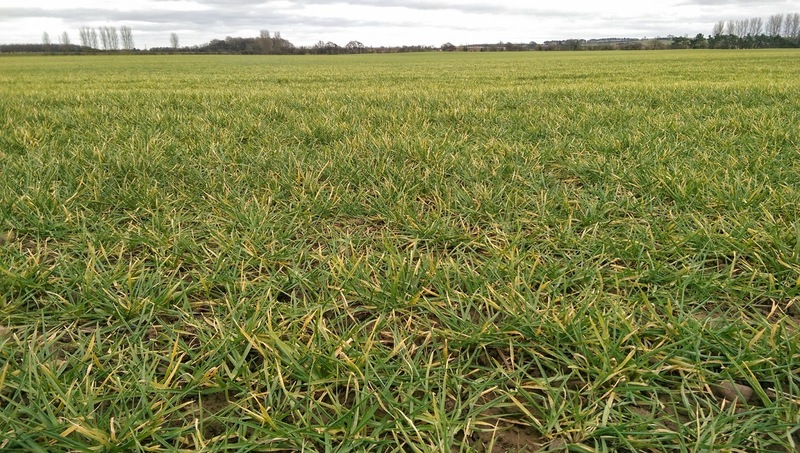 Heavy rainfall is predicted this week posing a threat to winter wheat quality. The warm, wet environment in June is ideal for the development of disease," said Martell Crop Projections. The USDA tonight had US spring wheat was rated 69% good to excellent, down 2 points on a week ago. The USDA's FAS in India cut their estimate for this year's wheat crop there by 5 MMT to 87 MMT, a near 9 MMT decrease on a year ago due to late season heavy rain and hail. They peg consumption at almost 6 MMT more than that, although they don't expect a huge increase in India's wheat import needs in 2015/16 due to large carryover stocks from recent previous bumper harvests. The issue as to exactly what condition these carryover stocks from previous years are in is an interesting one. Given the lack of capacity in India for proper grain storage, much of these stocks will have been stored on bags out in the open, and subject to all sorts of damage from insects, rats etc. Indian millers are said to have been quite busy of late buying Australian wheat to blend in with this year's low quality crop. SovEcon raised their forecast for the Russian 2015 grain crop by 5 MMT to 99 MMT, an excellent result if it could be achieved given all the problems growers there have faced. Production was 105 MMT a year ago when autumn establishment was much better and the credit to purchase inputs was much more freely available. They raised the wheat production estimate by 4 MMT to 57 MMT, now only around 2 MMT below last year. Despite that, they estimated that new crop sales by exporters were down 25-30% on concerns that the new "floating" export duty on wheat, which is tied to the value of the rouble, could prove to be rather costly given the volatile nature of the Russian currency. Jul 15 CBOT Wheat closed at $5.28, up 11 cents; Jul 15 KCBT Wheat closed at $5.44 1/2, up 9 1/4 cents; Jul 15 MGEX Wheat closed at $5.80 1/2, up 9 cents. 08/06/15 -- EU grains closed mixed, but mostly firmer, in a fairly quiet start to what could be an interesting week, with the USDA's June WASDE report due out on Wednesday. Also due then is ABARES Australian crop report, and before that we expect the USDA's first soybean crop ratings of the season to be released tonight, plus an update on planting progress in the US for corn and soybeans. Fresh news was relatively light during European trading hours ahead of that lot though. At the close Jul 15 London wheat was up GBP1.40/tonne at GBP117.95/tonne, Sep 15 Paris wheat was up EUR1.75/tonne to EUR186.25/tonne, Jun 15 Paris corn was EUR2.75/tonne higher at EUR167.75/tonne whilst Aug 15 Paris rapeseed fell EUR2.00/tonne to EUR374.50/tonne. Analysts Agromarketinfo cut their estimate for this year's soft wheat crop in Spain, where temperatures have been searingly hot lately, from 5.75 MMT to 5.48 MMT, and a small drop versus 5.59 MMT a year ago. They raised their ideas on imports from 3.3 MMT a month ago to 3.7 MMT this time round, although that's still less than the 4.08 MMT that the country is expected to import in 2014/15. Spanish barley production was also reduced, down from 7.39 MMT to 6.98 MMT, although that's still better than last year's 6.74 MMT. Barley import needs in 2015/16 were raised from 500 TMT to 600 TMT, also up versus 455 TMT in the current season. They were unchanged on their Spanish 2015 corn production estimate at 4.23 MMT, down from 4.47 MMT a year ago. Corn imports were also forecast unchanged from a month ago at 4.23 MMT versus 5.45 MMT in 2014/15. APK Inform said that Ukraine seaports exported more than 525 TMT of grains last week, up from the just under 421 TMT shipped out the previous week. Corn accounted for the vast majority of last week's exports (at more than 515 TMT), with barley making up the rest. Russian seaports shipped out less than half those of Ukraine, at 258.5 TMT, in the first week of June. That total included 141.3 TMT of wheat, 64.7 TMT of corn and 52.4 TMT of barley. Russia's exports since the export duty on wheat was cancelled on May 15 are 930 TMT of grains, including 533 TMT of wheat, 209 TMT of barley and 170 TMT of corn. Total 2014/15 season Russian exports to date are now more than 29 MMT, a 17.7% rise on the same period in 2013/14. Wheat accounts for 20.6 MMT of that total (versus less than 18 MMT a year ago), barley a further 5.2 MMT (versus 2.5 MMT) and corn an additional 2.8 MMT (versus 3.9 MMT). The Russian Association of Grain Exporters forecast 2014/15 carryout at a rather large 18 MMT. In Central Russia winter wheat is generally just finishing flowering. Some winter wheat in the Kursk region, post flowering, is displaying drought stress despite recent rain, said agronomist Mike Lee who is currently undertaking a crop tour of the region. The average winter wheat yield potential in Kursk is around 5.0 MT/ha, dropping to 4.2 MT/ha in Voronezh then 2.6 MT/ha in Saratov, he estimates. A recent Thompson Reuters survey concluded that wheat yield outcome in southern Russia will be mixed this year. Travelling from Krasnodar, north and eastwards through Rostov to Volgograd, their tour essentially found a gradual deterioration in crop conditions. The bottom line though was that "the present situation for Russian wheat is not cataclysmic," they said. Bulgaria estimated it's 2015 wheat crop at 4.3-4.5 MMT, down around 17% on the 5.3 MMT produced a year ago. Private Israeli buyers tendered in the market for 115 TMT of EU/Black Sea origin corn and 65 TMT of feed wheat of a similar origin for delivery spread between the end of the month and September. The USDA's FAS office in India cut their estimate for this year's wheat crop there to 87 MMT, down more than 9% on a year ago due to heavy rain and hail immediately prior to harvest time. They estimate domestic consumption at 92.8 MMT, but note that state owned stocks from previous bumper production years may not lead to a huge increase in imports in 2015/16. 05/06/15 -- Soycomplex: Beans closed lower on the day, but still slightly higher for the week. 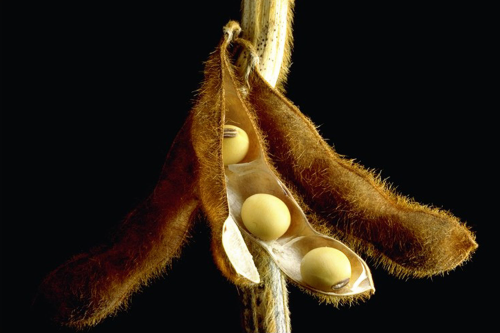 The Buenos Aires Grain Exchange reported the Argentine soybean harvest is wrapping up at 93.4% complete. Average yields are above expectations they say, and thus they raised their production estimate again to a new record 60.8 MMT versus 60 MMT previously. Ukraine's Ag Ministry estimated their 2015 soybean crop at a record 4.2 MMT, due to increased plantings which are seen up 9.4% this year to almost 2 million ha. They said that output there could reach 6 MMT on plantings of 2.5 million ha by the end of the decade. Canadian canola traded above CAD500/tonne for the first time since September 2013 following recent widespread reports of crop damage caused by last weekend's heavy frost. Growers there could still replant, although yields would be negatively impacted, and trade talk suggests that seed is now in short supply. The Government of Saskatchewan yesterday said that 22% of the crop there was in poor to very poor condition. A year ago that figure was only 1%. Canola rated good to excellent in the state was 44% versus 87% this time last year. The final planted Canadian canola area could hit a 5-year low 18 million acres this year it is being suggested. The weather outlook for the Canadian Prairies remains dry. El Nino typically causes dryness in the Western Prairies, Alberta and much of Saskatchewan, although Manitoba may fare better. These are exactly conditions that prevailed in May, say Martell Crop Projections. The USDA will update us on Monday how US soybean plantings are going, they were 71% complete as of last Sunday night, so we might be looking at a figure of around 80% done this time round. They are also likely to give us their first soybean crop condition ratings, with a fairly high good to excellent score expected. The weekly Commitment of Traders report shows fund money reducing the size of their overall net short position in soybeans by more than 9,000 contracts on the week through to Tuesday night. Jul 15 Soybeans closed at $9.37 3/4, down 8 3/4 cents; Nov 15 Soybeans closed at $9.14 1/4, down 9 3/4 cents; Jul 15 Soybean Meal closed at $304.90, down $0.80; Jul 15 Soybean Oil closed at 34.78, up 25 points. For the week that puts front month beans 3 3/4 cents higher, with meal down 80 cents and oil the big gainer - up 145 points. Corn: The corn market closed lower on the day, but higher for the week, just like soybeans. A sharp rally by the US dollar was a negative factor today. "Domestic weather forecasts continue to look beneficial to the crop with limited areas of concern. Drought monitors improved over the week," noted Benson Quinn. "The US Climate Prediction Centre increased the risk factor for El Nino, and are now predicting a 90% chance of an occurrence," said Martell Crop Projections. There appears to be strong evidence that an El Nino is in fact already in place, so what does that mean for US corn? 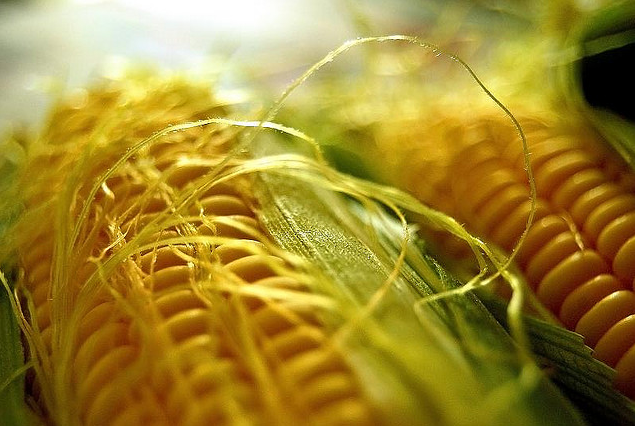 "There is no clear evidence that El Nino has much of an impact on corn yields. Out of 7 occurrences of summer El Nino, back to 1965, three corn harvests made a very productive yield (1972, 1987 and 2009), one made an average yield (1965) and the remaining three finished with a below average yield (1991, 1997 and 2002). Spring rainfall in the corn belt has been mostly favourable so far with ample, but not excessive, rainfall. No meaningful flooding has occurred. Corn development is on schedule, even ahead of the average pace, in several corn states. Overall conditions are promising at 74% good-excellent, 23% fair and only 3% poor-very poor," they added. The USDA will update us on those conditions on Monday, with little change expected. They will also report on corn planting progress, which was at 95% done last week. Benson Quinn think that this might now be reported at 97% done, giving rise to some talk of corn going unplanted in some of the wetter states. Colorado, Kansas, Missouri and Texas had the most left to plant last week. Elsewhere, the Buenos Aires Grain Exchange said that corn harvesting in Argentina was 39.4% done, and held steady with their production estimate at 25 MMT. FranceAgriMer said that corn planting there was finished and that the crop was 98% emerged versus 95% last week and 97% last year. They cut the proportion of the crop rated good to very good from 88% to 86%, which is now 2 points lower than a year ago. Brussels issued 292 TMT worth of EU corn import licences this past week, taking the total volume approved so far to 8.7 MMT, down 36% year-on-year. Russia said that their corn crop was 95.2% planted on 2.7 million ha. Fund money cut their net short position in corn by around 5,600 contracts for the week through to Tuesday night. They are still short nearly 135k lots though. Jul 15 Corn closed at $3.60 1/2, down 3 cents; Dec 15 Corn closed at $3.78, down 3 cents. Jul 15 was up 9 cents for the week. Wheat: The wheat market closed lower on the day, but with some fairly decent gains for the week. Dryness in Canada remains a concern, with the Government of Saskatchewan yesterday rating spring wheat crops there at 65% good to excellent versus 90% this time last year. Poor to very poor ratings were 6% versus only 1% a year ago. "Multiple weather disturbances through western Canada are not expected to significantly improve soil moisture in the driest regions, but there may be some benefit," said Benson Quinn. Unusually hot temperatures are being experienced in many parts of Europe, the Black Sea and Russia. The forecast offers more of the same. FranceAgriMer trimmed their good to very good crop ratings for winter wheat and winter and spring barley today. In the very good category, winter wheat was pegged 3 points lower on the week to 33%, winter barley was down 5 points to 29% and spring barley fell 6 points to 20%. The Russian government said that they won't change the new Jul 1 wheat export tax formula, despite industry requests to do so. They did say though that they may review the duty at some point in the future if it seems that the new system isn't working correctly. The Buenos Aires Grain Exchange said that Argentine winter wheat planting was 9.8% complete, up 5.4 percentage points in a week, helped by beneficial weather. They were unchanged on their 2015/16 wheat area estimate at 4.1 million ha. Egypt said that they might end up procuring 5.3 MMT of wheat on the domestic market this year, which is substantially more than the 3.7 MMT that they original estimated that they would buy. 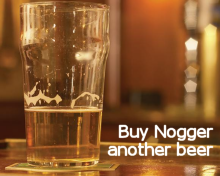 That would leave them potentially requiring fewer wheat imports. Kazakhstan said that drier weather had enabled growers there to make some catch up progress with spring plantings, which are now seen at 84% done on 12.35 million ha, although that still lags 97.5% complete on 14.34 million ha this time last year. This afternoon's Commitment of Traders report shows fund money trimming back their short position in CBOT wheat by more than 11,600 contracts, although they still hold a sizeable short. Russia said that their spring wheat crop was 96.8% planted on 12.8 million ha - exactly the same area that had been sown this time last year. How very convenient and coincidental that is! Ethiopia tendered to buy 400,000 MT of optional origin milling wheat for Jul/Sep shipment. Jul 15 CBOT Wheat closed at $5.17, down 6 3/4 cents; Jul 15 KCBT Wheat closed at $5.35 1/4, down 6 cents; Jul 15 MGEX Wheat closed at $5.71 1/2, down 4 1/4 cents. For the week that puts Chicago wheat 40 cents higher, with Kansas up 36 1/2 cents an Minneapolis gaining 40 3/4 cents.